Dust the tuna with the Szechwan pepercorn, let sit for 10-15 minutes, and then sear rare on all sides. Cook lentils in vegetable stock for about 30 minutes or until cooked. Remove 1/2 of the lentils and puree with cream. Fold pureed lentils back into non-pureed lentils. Saute the bok choy in the white soy sauce for a few minutes and then add the chili threads. Mix together the red curry paste, lemon juice and canola oil. Lay down about 1 cup of the lentils per plate. Place some boy choy on top of the lentils and then top with ahi tuna. Drizzle the red curry sauce around the plate and on top of the tuna. Serve hot. These are the best lentils I have ever had, they are creamy and so amazing. I paid a visit to Brick last week to see and taste for myself what Chef Marsh is bringing to the table. I must say that it's a big and welcome change from before. He's got something special going. 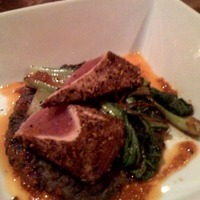 Take this Szechwan Dusted Ahi - he's paired it with creamed lentils that are absolutely fabulous. But the combination is what's intriguing. I've never had a dish like this, and now I can't stop thinking about it. Yeah, it's that good. Highly recommend a trip to Brick; and I will be trying to recreate this magic at home. This guy is one to watch. I haven't tried cooking Tuna with lentils but it sounds great. I could give it a try. Thanks for sharing.